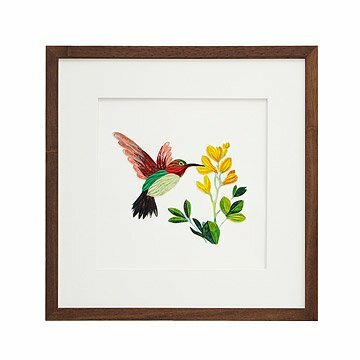 Handcrafted by skilled artisans in Vietnam, this gorgeous portrait of a hummingbird is constructed using the intricate art of quilling. First practiced in ancient Egypt, quilling has persevered through time, and the name comes from the origin of the art: birds' feathers, or quills, were originally used to coil strips of paper into delicate spirals. During the Renaissance, nuns and monks would roll gilded paper to adorn religious objects, mimicking costly gold filigree. Today, Vietnamese artists carry on this art form by carefully applying vibrant paper coils onto a printed image to create a 3D portrayal of a hummingbird sipping from a flower. Made in Vietnam. Framed in Portland, Oregon. Hanging where I can see it daily. I used to do quilling when I was a kid. I was so pleased to see professional quilling for sale, I had to buy this, as I love birds. It is so beautiful. It makes me smile whenever I look at it. Thanks so much for such a unique and beautiful piece and for great customer service!